I saw this shaving foam marbling idea ages ago and managed to forget but it was brought back to my attention on the artbar blog and I decided to try it. 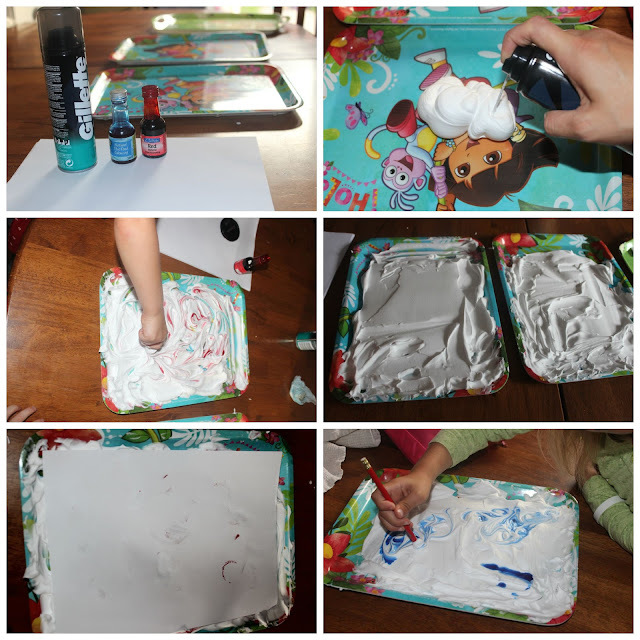 You will need shaving foam, food colouring, a tray (or multiple trays if using more than one colour), a ruler or alternative straight edge, something to stir with, a bowl and paper. You begin by spraying your white foam onto the tray and spreading it out into a smooth layer approx 1cm deep. Add a few drops of the colouring to the foam and swirl using a pencil or straw. Children may wish to simply make circles but try to guide them to vary lines so that I the colour will reach corners too. Place a piece of paper face down on the foam and press gently so that all of the paper is touching the foam. Remove the paper and use the ruler to scrape off the foam into the bowl. Repeat with more paper adding more colouring when desired. Leave to dry and you should have a variety of marbled paper to play with the next day. I have a few ideas of what I'm going to do with this paper but I still haven't got round to it yet and rather than wait another week or so, I thought I'd share this post now since it's been a little while since my last craft confession. I have a few other posts in draft form that are waiting for pictures or edits which I will endeavour to complete quicker than this last one and with updates of previous posts.